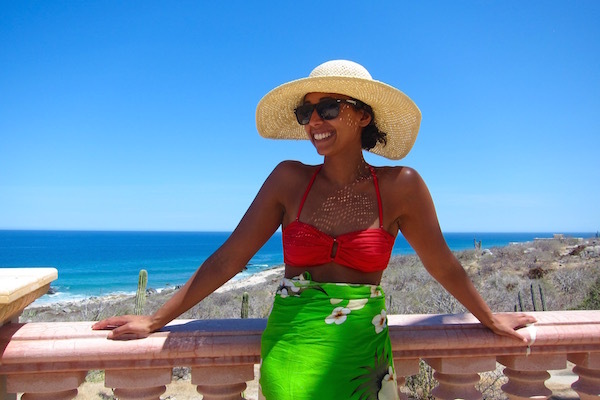 While doing research for our vacation, I realized that even though we wanted to go to Cabo—it was the most affordable, logistically-sound beach destination to fly from San Diego—we did not want to go to Cabo. Let me explain. 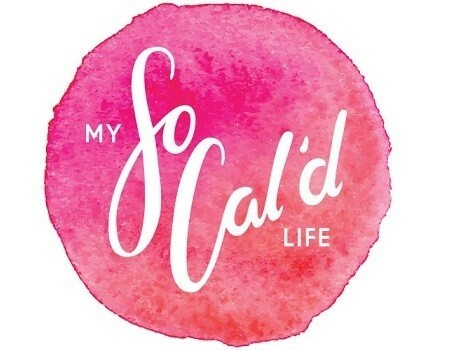 What I had found in Cabo were tequila-shot-chugging parties, massive/generic hotel chains, wildly expensive luxury resorts, and more often than not, a lack of availability given our last-minute planning. (I’m sure there are wonderful off-the-beaten path finds, like this restaurant I want to visit some day, but I couldn’t find many. I wanted to get really off-the-beaten-path.) I wanted something quiet, on the beach, and for $100-200/night. I was told that would be impossible. But I prevailed! 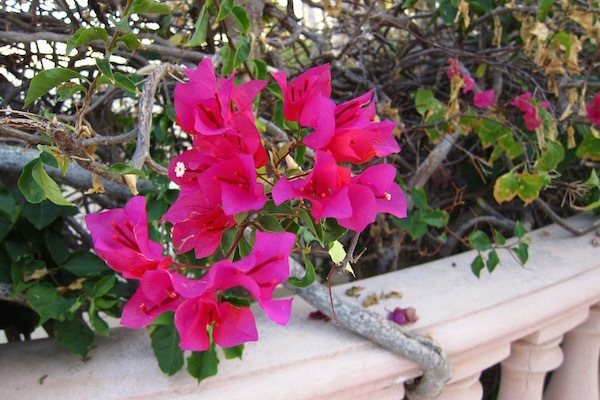 In a last-ditch effort, I looked up ideas on one more site, and on a map of hotels, I saw a star indicating a hotel on Cabo’s East Cape. 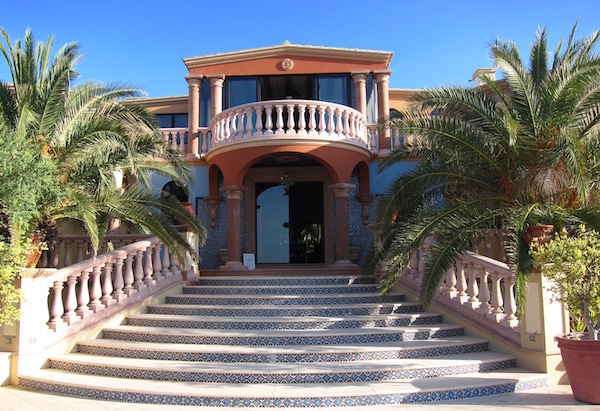 As it turned out, it was the dreamy hotel Villa Del Farro, and this is where we spent a glorious 4.5 days last week. 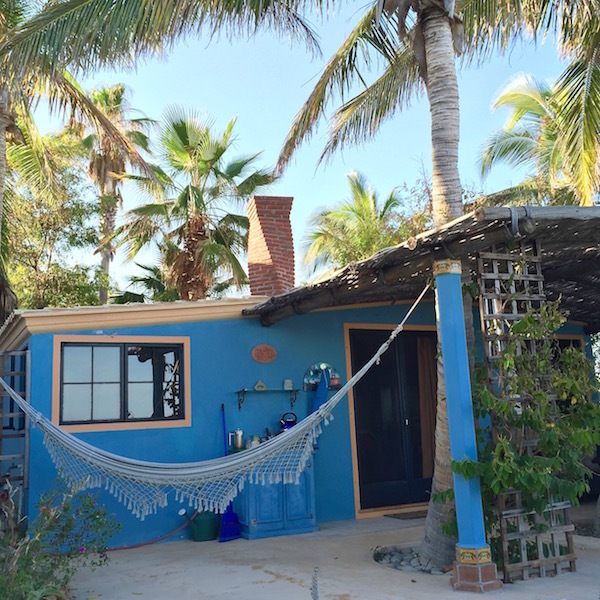 Villa Del Farro is located on 12 acres in Baja’s East Cape—a sprawling mansion split up into individual accommodations with a breakfast room, pool, and the great outdoors to share. 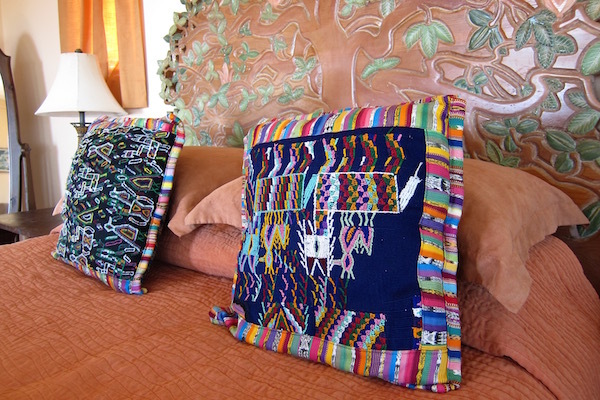 Owned by an extended family of siblings and their spouses, VDF has seven different casitas, each with its own decor scheme. 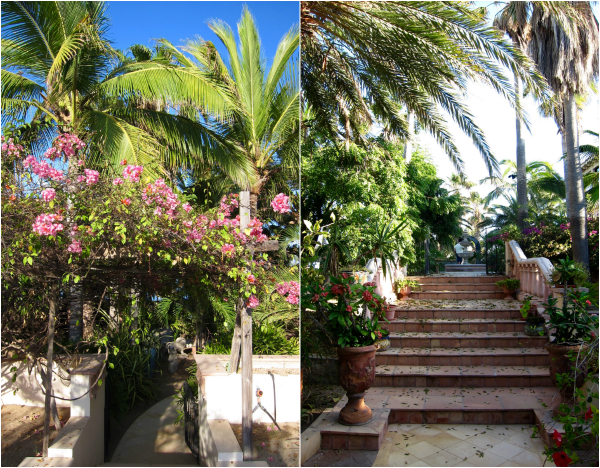 The grounds of the property are lush like a rain forest, with the desert on one side and the beach on the other. Because getting there requires an hour’s drive on a dirt road—we rented a car for $4/day—and there’s almost no other sign of life in the area minus a few homes, it’s incredibly, wonderfully secluded. That means it’s also very much an eco-hotel and suited to a certain type of traveler. There are no power lines, water heaters (solar panels instead), or air conditioning (you’ve been warned! ), and drinking water is trucked in from a local ranch. With the area’s iffy plumbing network, guests also can’t flush toilet paper down the commode. That said, as long as you’re willing to handle a few glamping scenarios, the payoff is 100 percent worth it. Nay, 200 percent. 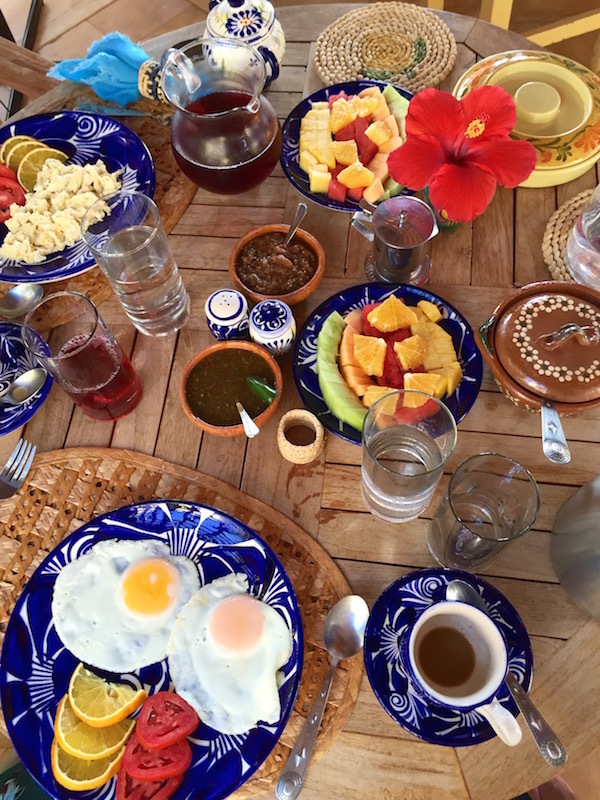 The owners have paid such amazing attention to decor details, the breakfast (included in the rate) is huge and delicious, and most importantly, the area is so quiet and the stars shine so bright, that it was just the recharge we needed. The world is so big that I rarely say I’ll revisit somewhere so soon, but I can absolutely see us making this an annual trip. It’s a special place. The property is very tropical-meets-mansion. Strolling around the grounds felt like walking meditation. There were so many great rooms to choose from that we split our time between two. If you’re up for some glamping, the Bali Room ($150/night) is the place to do it. We spent our first three nights in that room, which has an amazing view of both the ocean and the desert. 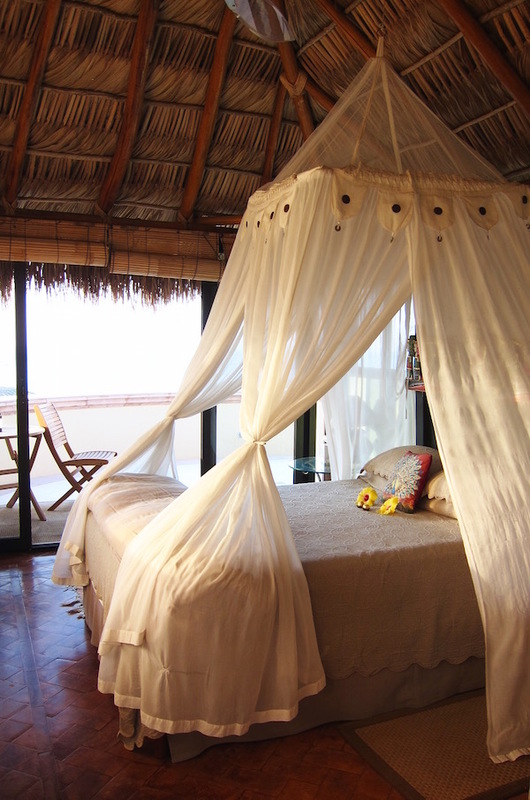 The design is very much rustic, with a palapa roof and mosquito net, and one wall of windows completely open (with curtains if you so desire). We did see a scorpion outside our room and someone else saw a fruit bat another night, but this is a remote place. Get used to the occasional critter! Breakfast was an elaborate spread. They took our orders the previous day, and we could choose from eggs, beans, tortillas, tropical fruit, yogurt, and/or granola along with juice and coffee. You could literally request all of that. As for lunch, you’re on your own. We were usually too full from breakfast, but we had also grocery shopped before arriving at VDF. With no stove, we opted for cold foods like nuts and dried fruit, sandwiches, etc. For dinner, the hotel offers a $45 three-course dinner, but we never tried it. 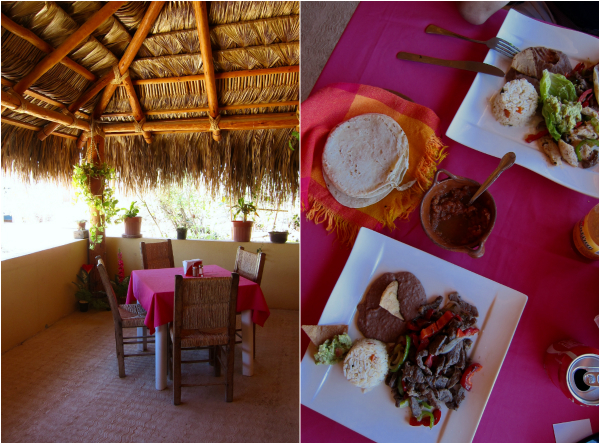 We either made our own food or headed up to Cabo Pulmo’s few restaurants (more on that below). Ah, the pool. I seriously love a good pool spread. 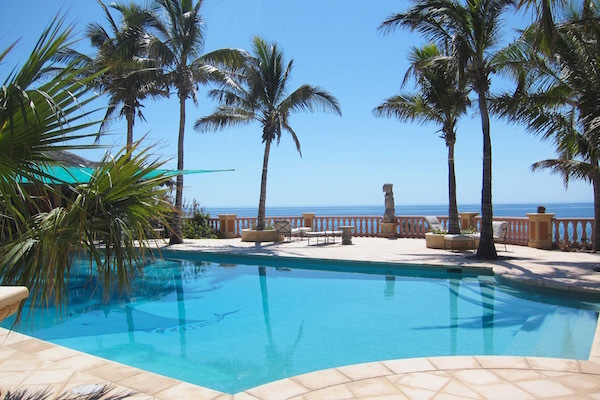 This one had stunning columns, a well-furnished pool house (which you could use so long as no one was checked in there), and ocean views. It felt straight out of a five-star resort. We spent two full days on our pool chairs, doing nothing but reading, napping, and eating potato chips. I finished The Art of Fielding (so, so good) and made good progress on Mr. Penumbra’s 24-Hour Bookstore. 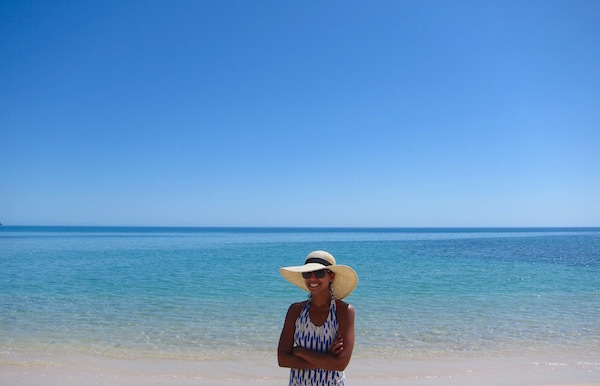 Cabo Pulmo is a small town 30 minutes north of the hotel, and though we were hesitant to do anything more than sleep by the pool, the drive was actually pretty simple and added great variety to our trip. What’s to love? First, the food. 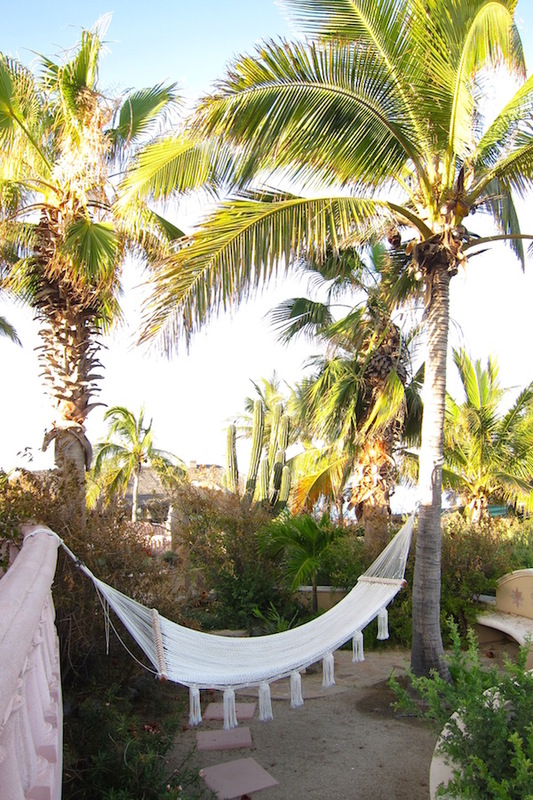 Caballero (above) is a laid-back taqueria-meets-dive bar, and our other favorite, La Palapa, has a great beach view and the cutest family of dogs snoozing around the restaurant. Also, the nachos at La Palapa are dynamite. Second, the beaches. 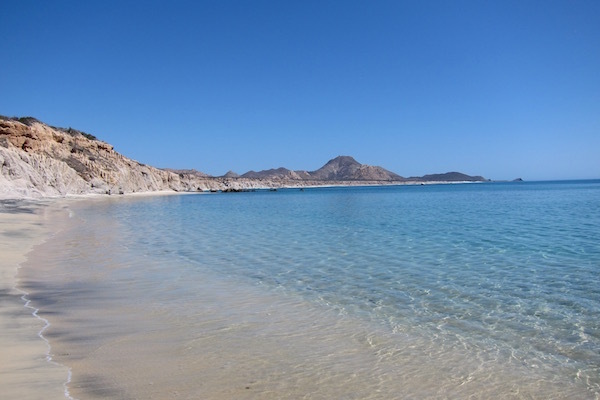 The area surrounding Cabo Pulmo is home to a 20,000-year-old protected reef known as Cabo Pulmo National Park. 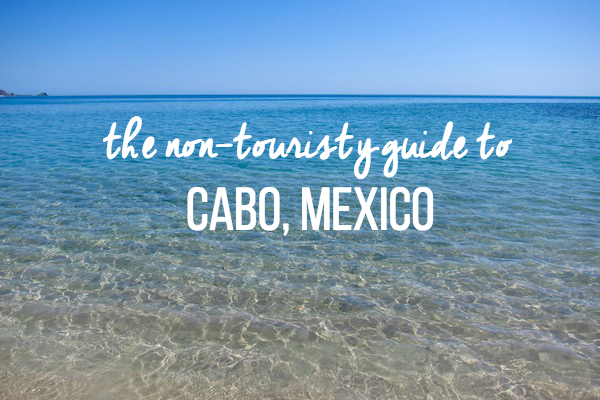 You can snorkel off the beach at nearby Los Arbolitos (the reef looked a bit dead to us) or book a dive or snorkel trip in Cabo Pulmo proper. 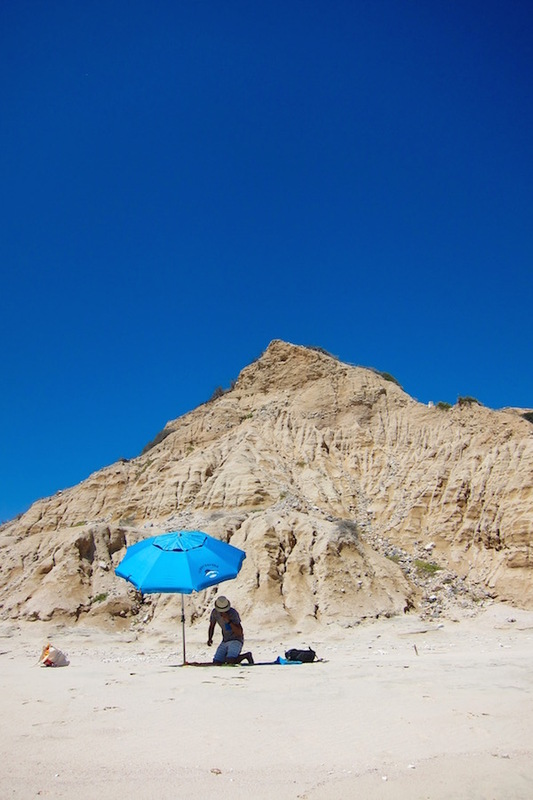 Or you can do as we did, and park at Los Arbolitos, walk left five minutes over some rocks, and find yourself on a secluded beach. As in, we were the only people there all day. We brought an umbrella from our hotel, and splashed the day away. I’m not sure I’ve had a more fulfilling and magical beach experience. That water was pristine like a screensaver and clear like a pool. A very pinch-me moment that easily turned out to be our favorite memory from the trip. Take me back! if you ask me now (and not few years ago), i would totally choose this over overcrowded, overhyped places. you look so pretty!!! Your trip looks amazing! You’re giving me some serious wanderlust!